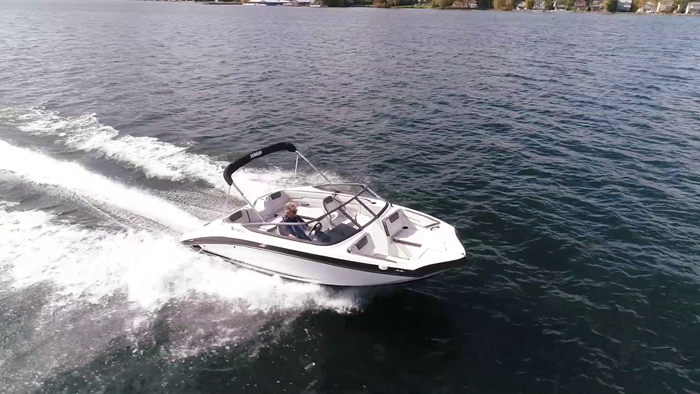 For it’s size, Yamaha’s latest SX190 is an all-around, generously proportioned sport boat packed with technology. Best of all, its lots of fun for cottagers, weekend warriors who tow their boats, and families who love watersports. With an overall length of 19’5” and its wide, 8’2” beam, the SX 190 sets itself apart from the competition. Tried and true to the Jet Set, Yamaha stands firm in its commitment to boaters who, for many reasons, understand and appreciate the benefits of owning a jet boat. Renown for manufacturing high quality leisure products, Yamaha boats are subject to stringent standards. Their models are fresh and current, ultimately built for enjoyment - and by multiple generations. Through decades of experience, Yamaha boats have stood the test of time – something that shouldn’t be taken lightly. Safety always comes first. 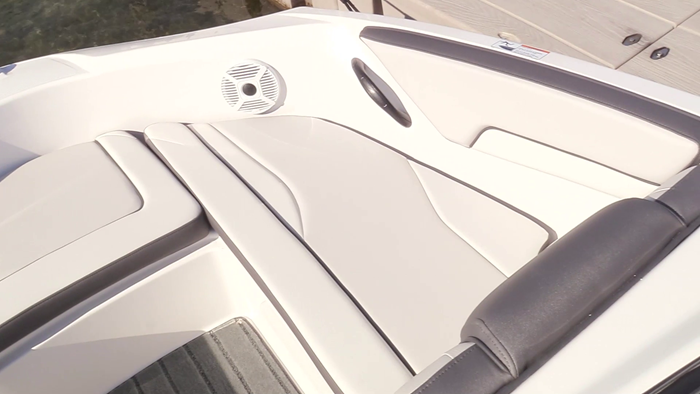 Take for example Yamaha’s deep, double-tier integrated swim platform with its three-step stainless steel telescopic boarding ladder and aft-facing backrest cushions. 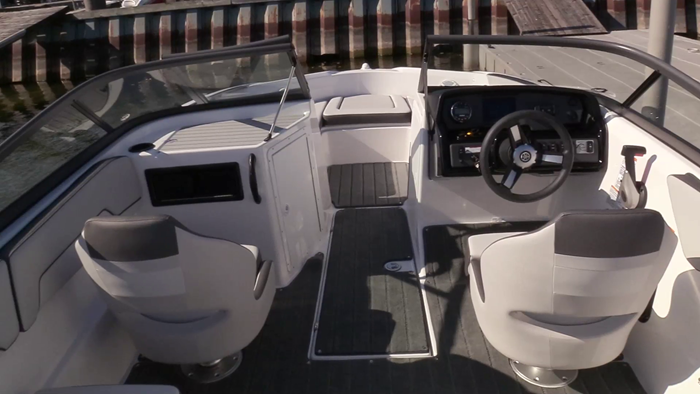 Swim, ski, wakeboard or tube, you’ll appreciate the SX190’s transom design. Not only does it cover all of the drive’s external components, surface features include slip-resistant Hydro-Turf matting and a molded non-skid surface for sure footing. Note the ample wet storage compartment and ease of access to the impeller for quick and safe weed removal. When the lid is up, the engine cuts off – a simple, yet effective and vitally important safety consideration. As one might expect, Yamaha jet boats do many things well, rigged and outfitted to deliver memorable times, inside and out. Moving forward into its cockpit, we found the boat to be spacious for a 19-footer. Featuring a U-shaped lounge and plush, open-backed slide and swivel buckets for the driver and companion, the SX190 can seat eight people comfortably. 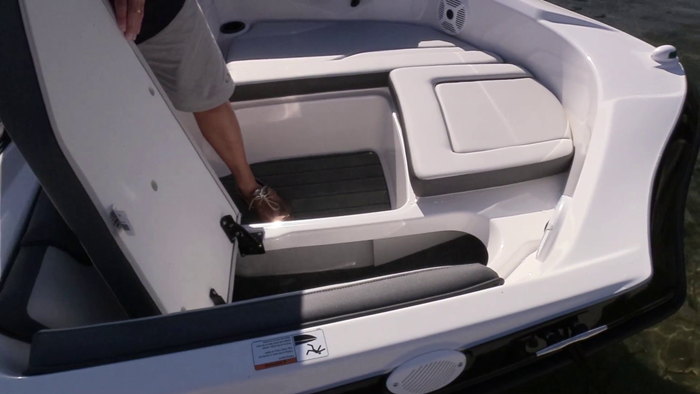 When boating with that many, you’ll be thanking the Yamaha designers who wisely placed some very large, even cavernous, storage bins into the floor and under primary seat pads. The moulded-in anchor locker was also given preferred treatment. It’s not unusual for runabout builders to boast, “generous open space forward”, but Yamaha’s 190 actually walks the talk. 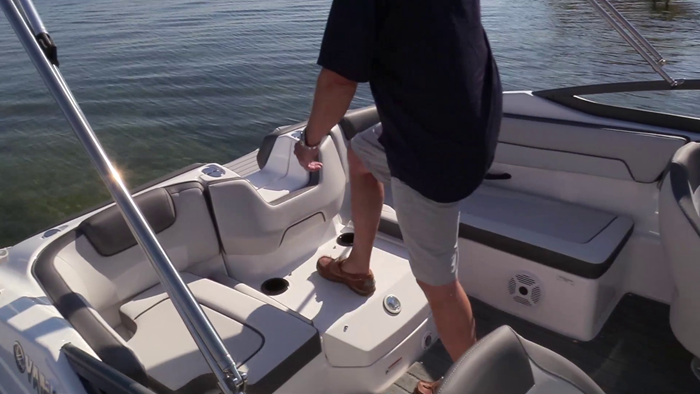 While its wide beam helps, useful features like grab handles, beverage holders, side panel pads and front-facing lounges add much to one’s adventures. Drivers will value this boat’s clean, appropriately appointed helm. 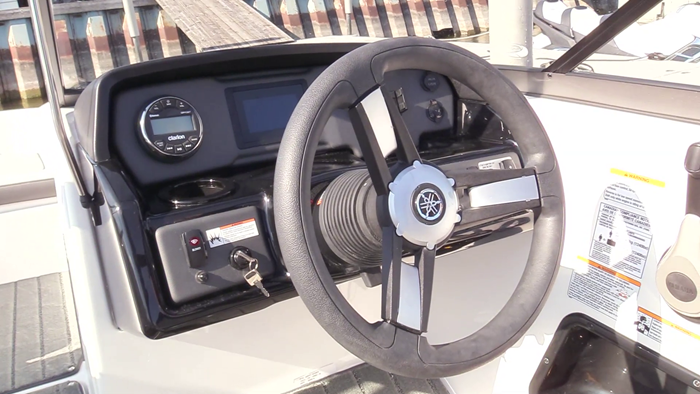 Highlights include a shaded instrument panel, rocker switches, Bluetooth stereo, tilt steering wheel, smart phone holder and the Yamaha Connect 4.3” touch screen interface with cruise assist and no-wake modes, a handy feature for incremental speed adjustment. 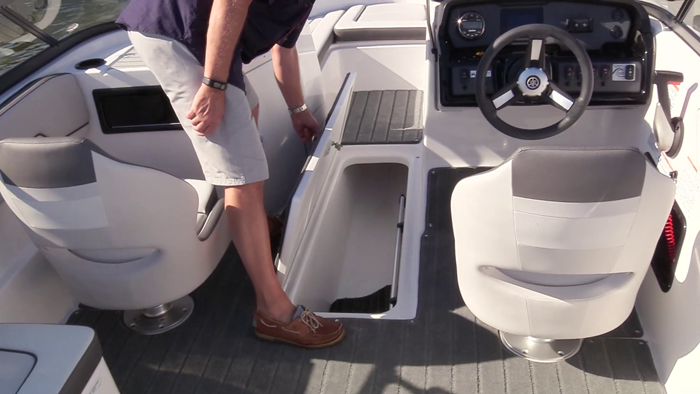 For some, what lies under the hatch may be of greater interest; Yamaha’s single 1.8L High Output, four-stroke engine coupled to a Direct Drive transmission, 155 mm High Pressure Axial Flow pump and a 3-blade, stainless steel impeller. While jet boats track well at speed, docking one can get interesting when confronted with wind and current. Thankfully, Yamaha’s new rudder and downward thrust deflector helps considerably, especially when backing up. Onward to the open lake we ventured - and fortunate we were to be testing a jet propelled, 14” draft hull while crossing some shallow water near shore. Planting the throttle, the SX 190 planed in 3 seconds, hit 20 mph in 5 seconds and 30 mph just four seconds later. As expected, the engine revs remain high, with a 7000-rpm reading confirmed while running 33 mph. Reaching 35 mph in 14 seconds, we later topped out at 38 mph turning 7350 rpm. To our liking, steady winds were responsible for creating choppy one-and-a-half-foot waves on Lake Simcoe. While rough water can certainly add excitement, it makes you acutely aware of how well your boat will handle, and how comfortable it will ride, when the going gets tough. We were not disappointed. Yamaha’s SX 190 ran level and free, turned on a dime and gave change. Its 18-degree deadrise hull handled predictably, cutting through waves of various heights while encountering wakes from approaching boat traffic. Naturally the hull scrubbed off some speed while turning at full throttle, but its revs remained consistently high. At rest or wide-open throttle, the SX 190 pays dividends. A proven multi-purpose performer, it’s not only attractive, but well priced. A Bimini (TM) top and Swing-away Tongue trailer come standard.